Built in 1926 as the east coast headquarters of Paramount Pictures, the 33-story Paramount Building is located at 1501 Broadway, between 43rd and 44th Sts. 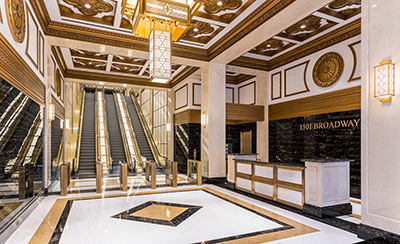 As a centerpiece of the renovation, the building’s main entrance was moved from Broadway to 43rd St., expanding the lobby with higher ceilings, escalators and Art Deco-inspired finishes. The design – named by Engineering News Record as a 2018 Best Project award winner – pays homage to the building’s historic charm, which carries through to include a new entry marquee. Further enhancing the tenant experience, Macchiato Espresso Bar leased space in the Paramount Building’s new lobby. The improvement program also included replacement of the Paramount Building’s 1,500 windows, new elevator cabs, building system updates, and the full renovation of common corridors and bathrooms. For more than 65 years, LMC has served as a trusted single-source commercial real estate services provider for institutional and private owners. LMC today maintains a diversified portfolio of approximately 105 properties totaling 15 million s/f in the Northeast and Mid-Atlantic states, offering leasing, property management, financial management and reporting, construction and development, lease administration, marketing services, and acquisition and disposition consulting services. The company specializes in repositioning, retenanting and renovating real estate – areas that have become particularly vital in an increasingly competitive market. LMC’s capabilities continue to evolve with new technologies, efficiencies and sustainability-focused initiatives to serve a new generation of properties, investors and tenants.